Bioinformatics and Biochemist Scientist, IGI Institute – University of California, Berkeley. 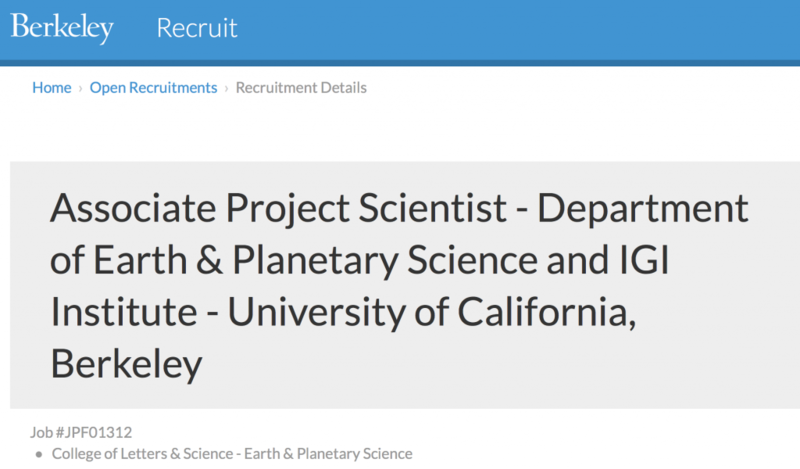 The IGI Institute and the Department of Earth and Planetary Science at the University of California seek applications for a full time (100%) Associate Project Scientist, Step I – III, in the area of biology of uncultivated bacteria and archaea from new branches of the tree of life and roles in biochemical cycling the terrestrial subsurface. This position has an expected start date of August 1, 2017 (or thereabouts). Description: We are searching for a Bioinformatics and Biochemist Scientist to serve as a primary resource for researchers in the Innovative Genomics Institute (IGI) in partnership with UC Berkeley and the CZI BioHub, focused on advancing the science of uncultivated organisms across the Tree of Life. The Scientist will work with the Banfield Lab, UC Berkeley to develop, design and analyze genomic and cultivation-based experiments designed to explore the unknown physiology of life of two major evolutionary radiations within the tree of life. One forms a major branch within Domain Bacteria, the other in Domain Archaea. The first is referred to as the “Candidate Phyla Radiation” (CPR), the second “DPANN”. Together, these sub-domains may represent more than one third of all of the diversity of life on earth. The mission involves performing bioinformatics, statistical and biochemical approaches to advance our understanding of the role of uncultivated microorganisms across various ecosystems. A component of the position will be to contribute to supervision of around 5 postdocs in IGI and Banfield Lab. The appointee will serve as a central point of contact for comprehensive analysis of genomics data coupled by experiments in lab. • Provide expertise and guidance for postdocs in computational genomics and biochemistry for the analysis of genomic data and the development of experiment-based approaches, most frequently resulting from genome reconstruction and analysis. This will include use and development of computational pipelines for analysis of genomic data, primarily high-throughput sequencing data from a variety of platforms. • Several years of experience working with biochemistry and metagenomic data, as exemplified by the following areas: high-throughput sequence analysis, functional genomics, population genomics, comparative genomics and extensive collaborative work with wetlab researchers. • Familiarity with genome databases and statistical analysis methods. • Experience with phylogenetic and statistical analyses of the molecular genomics of microbial communities. • Strong interest in metagenomics. • Strong Experience with microbial metabolism. • Strong Experience with biochemistry of proteins. • Ability to communicate effectively in a highly diverse, cross-disciplinary environment. • Experience in genomic data exploration, visualization, and figure preparation for publications. • Ability to complete and describe projects, demonstrated for example by journal articles and/or preprints. Salary Range: $67,800 – $75,200. The appointment will be for one year with the expectation of renewal for at least four additional years, pending satisfactory performance. How to Apply: To apply, please go to the following link: https://aprecruit.berkeley.edu/apply/JPF01312 Applicants should submit a cover letter, curriculum vitae, and contact information for two references. Letters of reference are not required at this time. A statement of contributions to diversity is optional. We will seek your permission before contacting your references. All letters will be treated as confidential per University of California policy and California state law. Please refer potential referees, including when letters are provided via a third party (i.e., dossier service or career center), to the UC Berkeley statement of confidentiality (http://apo.berkeley.edu/evalltr.html) prior to submitting their letters. For questions, please contact Roxanne Polk at rpolk@berkeley.edu. The University is interested in candidates who will contribute to diversity and equal opportunity in higher education through their work.